This trip was planned for you to explore to the Colca Valley. You wanted to hike through the deep canyon, explore pre-Inca archeological sites, visit pretty colonial towns, and watch for Andean condors. But it isn’t the colorful terraces, the rock art, the little churches, or the huge birds that have become your favorite part of the day. It’s the thermal pools that you hadn’t even known about in advance. These thermal pools—there are not one, not two, but four of them—are fed by natural hot springs. Each one maintains a different constant temperature. They’re all rich in lithium, which can do everything from strengthen your immune system to support bone health, depending on whom you ask. They’re all open 24 hours a day, so you can soak as the sun rises, after a long trek, or once the dark sky brightens with stars. They all have stunning views, since they’re along the riverbank of the Río Colca with the Andes towering in the background. Plus they’re all right at your hotel. 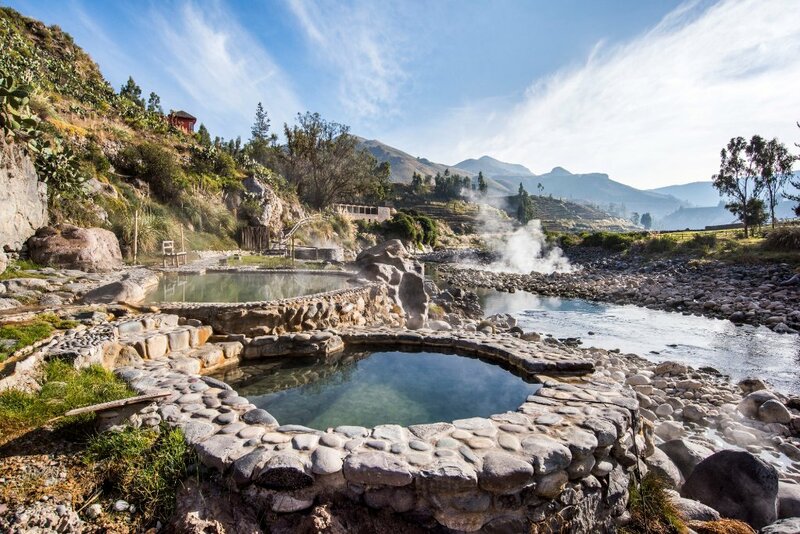 You had booked a room at the Colca Lodge Spa & Hot Springs for its convenience. The lodge is two hours from Arequipa, the largest city in southern Peru. It’s in the Colca Valley, which is home to one of the deepest canyons in the world. It’s right across the river from Yanque, a traditional town where descendants of the Quechua people still live on alpaca farms and wear clothing with unique embroidery. It also offers easy access to trout fishing, mountain-biking trails, and more hiking paths to more historic sites than you could ever hope to accomplish. Not that the lodge didn’t look relaxing. Crop terraces and gardens surround it. Adobe and clay buildings blend in with the landscape. Your rustic room is simply decorated with earth tones. But the stone floor is warmed by geothermal activity, and the bathroom is completely modern. Puye Restaurant serves Alpandina cuisine, which is heavy on quinoa and alpaca meat. Freshly caught trout is grilled over charcoal at the riverside Barbecue Bar, as well. While the spa, usually one of your favorite spots, is being largely ignored on this trip. The Colca Valley was inhabited long before the Incas arrived around 1320 AD. The rock artwork and mummies prove it. The Incas built fortifications and began farming the land. Stone ruins and stepped terraces still fill the valley. The Spanish eventually arrived in the 1540s. Franciscan missionaries and religion followed them. The deep canyon made access, much less development, difficult, though. 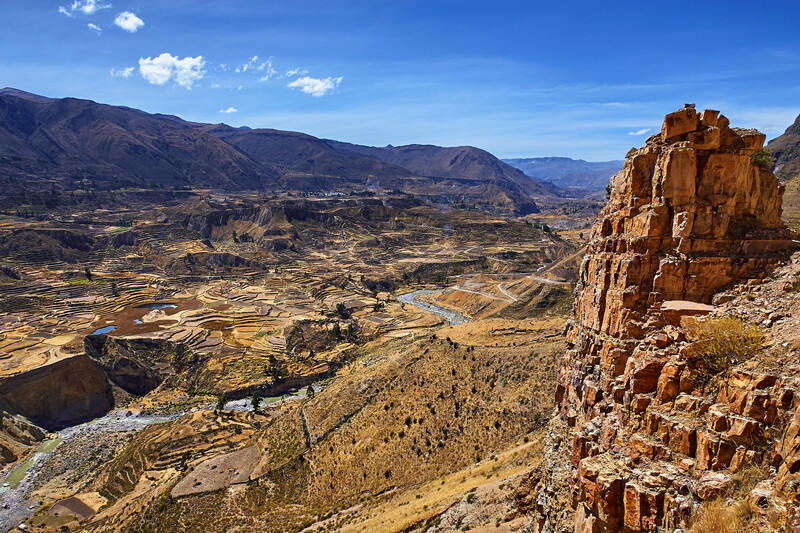 Colca Canyon is more than two times as deep as the Grand Canyon. So the first roads—for the copper and silver mines—weren’t created until the 1940s. Much of the area still feels remote and inaccessible. That’s a good thing. You came to hike to the Uyo Uyo ruins, the Mollepunko Caves, and the Fortaleza de Chimpa in peace. You can search for giant hummingbirds and Chilean flamingos, foxes and vicuñas (wild llama relatives) in silence. You can take a moment alone in the Iglesia de la Immaculada Concepción. Then you can return to your private (it may as well be) thermal pool and stare at the gorgeous scenery. A surprise along the way turned out to be a very good thing.